We were approached by a garment decorating specialist who wanted a system that could hold the latest product info from leading garment suppliers, allowing them to present a fully populated website that could be easily branded for any company. This solution would then be offered to other garment decorators. The system we developed is very complex and allows white label websites to be created as either ecommerce or non-ecommerce versions. It also allows ‘affiliates' to run a website, concentrate on promoting the products without having to deal with the garments or with customer enquiries. 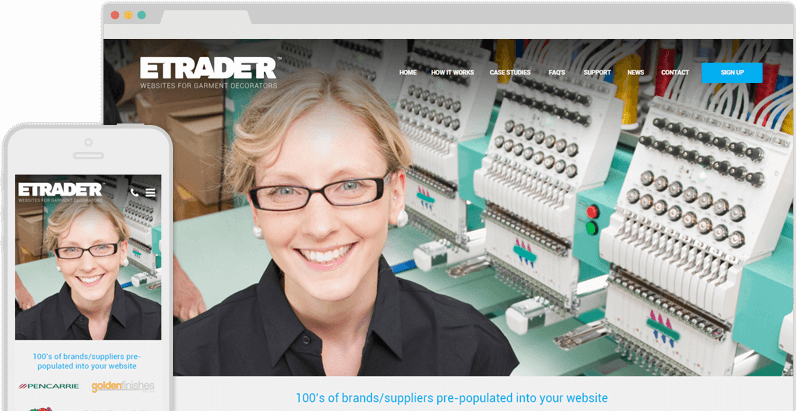 We created a white label ecommerce platform, allowing eTrader to sell pre-populated ecommerce websites to garment decorating companies. The eTrader system is extremely flexible, and yet it is straightforward enough to be understood even by those who know little to nothing about websites. "The eTrader websites that we have created in partnership with Designer Websites are just incredible. These websites are fantastic for anyone in the garment decorating business and the way they have been developed allows us to offer them to our customers at a very low cost. The skill to create a system like this, with this much flexibility is clearly a significant strength for your business and without that we would not have been able to create this system, so from all of us at eTrader we would like to thank you and your team for your hard work and continued support." John Sheppard, Managing Director of eTrader Websites Ltd.
White Label Ecommerce: eTrader Websites The eTrader brand is owned by a veteran garment decoration expert in the UK. The highly-optimised white label websites that eTrader supply are built upon a massive database of blank products, supplied by the largest blank garment wholesalers in the UK. The products include t-shirts, polo shirts, hoodies, etc. all of which can be personalised with the customer’s own logo or artwork. Website owners can also add their own brands and products, allowing them to create custom shops for regular customers. 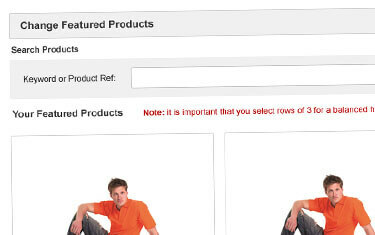 This functionality is fantastic for garment decorators with large customer databases, e.g. schools, sports clubs, and large organisations. The eTrader websites all use the same database and the same underlying structure, and yet each one has a unique design and their choice of brands and products, allowing the owner to market their eTrader site in any way they choose. This versatile, user-friendly white label system was built from the ground up by the expert designers and developers here at Designer Websites; we also created a responsive brochure website for eTrader themselves, allowing them to effectively market their unique service to a wide audience. 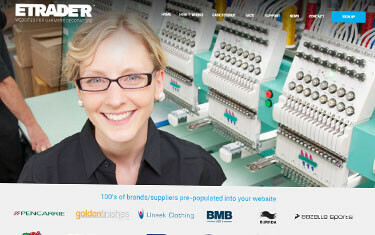 Garment Decorating Websites: eTrader The eTrader brand is owned by a veteran garment decoration expert in the UK. The highly-optimised white label websites that eTrader supply are built upon a massive database of blank products, supplied by the largest blank garment wholesalers in the UK. The products include t-shirts, polo shirts, hoodies, etc. all of which can be personalised with the customer’s own logo or artwork. 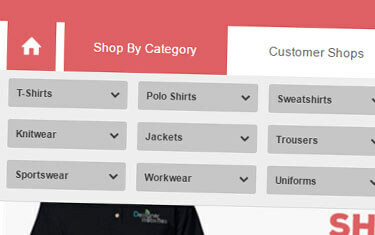 Customisation OptionsThe eTrader solution is built upon a massive range of blank garments from a number of well-known suppliers. When setting up an eTrader website, the affiliate can either display the company’s full product range or select specific brands and/or product types to promote. The system caters for this very well, with a bespoke content management system (CMS) that makes it easy for site owners to suppress brands and products that they don’t want to include. The CMS also allows SEO-savvy site owners to customise each page’s copy and meta tags in order to target specific keywords and rank highly in search engine results. eTrader’s Own WebsiteIn addition to the white label system described above, we at Designer Websites were also asked to create a responsive brochure website for eTrader Websites Limited themselves. 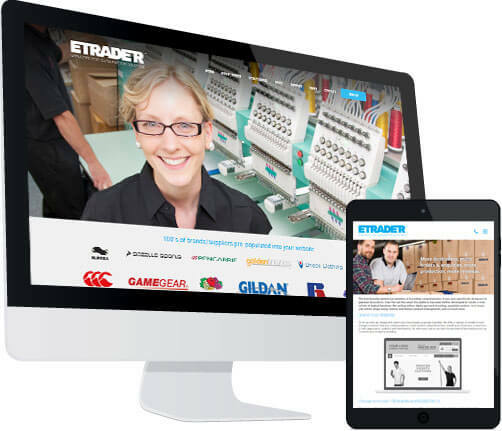 This website – www.etraderwebsites.co.uk – has a modern, professional-looking design and great functionality across all devices. including smartphones and tablets. This enables eTrader to promote their service effectively to the broadest possible array of web users; the sophisticated yet straightforward sign-up form even allows you to apply for an eTrader website online!